We lost a member of the family last week. Our poor Accord has gone to car heaven. Not only is this little guy deemed unworthy to drive, he is now our little cash cow. 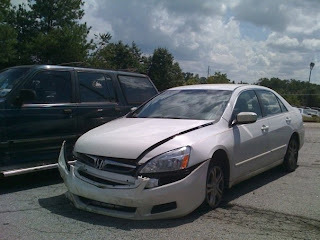 We are the lucky recipients of an insurance check for more than we bought the car for. Wa-hoo! Lucky us. Ok, maybe just a cash calf. But at least it covers our cost and then some. So now we get to go car shopping again, all too soon, and we are not thrilled about it. We are using it as an opportunity to get out and see the world. This weekend we went to Charlotte to look at a few cars that we liked. Fun little weekend. Seemed like ALOT of driving but I guess I only feel that way when I am driving. BORING! 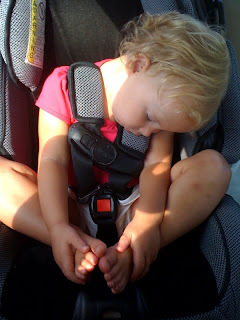 Sierra was a trooper as usual but on the way home she was exhausted from two days of no naps. Such a Cutie! good luck!! wow- ya'll are serious car shoppers to go out of state!!! Who was the culprit in laying the car to rest? You or Joe? lol. Well that is sweet you got hooked up with the insurance check, happy shopping.